Well, not really. 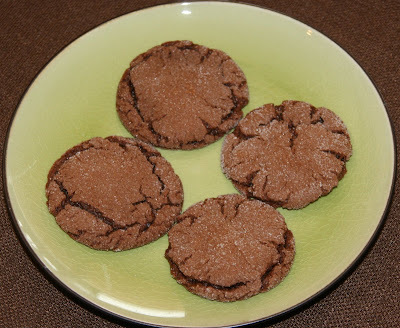 But diets aren't any fun, and cookies are, so here are two of my favorite cookie recipes. I'm big on soft cookies and both of these are soft and stay that way, but they're not crumbly. I chill the dough on both of these recipes so they are easier to handle. I also think they are both better the next day, after they've had a day to set up and become the cookie they are destined to become. In a large bowl, cream together the margarine and 1 cup sugar until light and fluffy. Beat in the egg, then stir in the water and molasses. Gradually stir the sifted ingredients into the molasses mixture. Shape dough into walnut sized balls, and roll them in the remaining 2 tablespoons of sugar. Place the cookies 2 inches apart onto an ungreased cookie sheet. Bake for 8 to 10 minutes in the preheated oven. Allow cookies to cool on baking sheet for 5 minutes before removing to a wire rack to cool completely. Mix cake mix, eggs and oil. Place about 1 tsp of dough in hand and flatten. Place 1 Rolo in the center and roll into a ball. Roll in sugar. Place on an ungreased cookie sheet. Bake 7-10 minutes at 350. Note: I use the small Pampered Chef scoop and it makes exactly 36 cookies. The dough is pretty thick so I use my bosch to mix it with the dough hook, but you can use your muscles if you are so inclined. And one more note: there are 8 rolos in each package, so you will need 4 1/2 packages for this recipe. What you do with the other 4 rolos is up to you. Or, you could just buy one of those big bags, but then you have to unwrap the little buggars. Yumm! The Rolo one even fits my 5 ingredients or less baking quota....I'll have to try that one for sure! If it came from Betty Crocker-oops-I mean Anne Marie, I know it will be TASTY! Oh yum I love new cookie recipes!!! I still remember when you brought me those soft ginger cookies! They are truly the best soft ginger cookie ever! Everyone should try them! Even my picky little eaters love them! PS Sounds like Samuel is really struggling. I feel so sorry for Laura! I'm still praying for him! I will have to give them a try. Ryan loves ginger-type cookies, and soft cookies are always better. Aren't those the Rolo cookies you took to Heidi's? If so I am glad you posted the recipe because they were really yummy. We need to make these when you guys come out. I'll get the ingredients... I can't wait!! Oh ginger cookies are my absolute favorite! I'll have to try these on my free day this weekend. Yummy, they both sound great! Oh, I want to try them. Especially the rolo ones. Thanks for posting these. Feel free to post recipes whenever you can. I wish I could say I have the will power to have a diet to ruin, but I just don't. And not everyone can eat cookies and look like you! Ok I am almost done setting up the recipe blog. Do you mind If I post these cookie recipes on it? I will let you know when it is finished. I can't wait to try the rolo cookies. Sadly no one in my family really eats cookies I make (I guess that's sad for my cooking skills) so I'll end up eating all of them. Yum! You evil, evil little girl. I'm not on a diet, per say, but I just try not to go over board toooo often. Unfortunately Cookies are my downfall! I've heard you rave about those ginger cookies before, so I guess I'll just have to try them. And the rolo cookies even sound dangerous. You evil, evil girl. I love your ginger cookies!! Those are so yummy!! I can't wait to try the Rolo cookies! Are they like Amy Clifton's recipe a little bit?? Those are good, too. You're such a good cook.... I love everything you make. My kids still talk about the cinnamon rolls you make. I just made the ginger cookies last night and everyone loved them. Thank you for the recipe!